Three more weeks until Baby Miller's due date! My, how the time has flown. The amount of cooking I've done recently has been disgraceful, but carrying around a baby all day in your belly can be pretty tiring, I guess. When I have been cooking, it's been recipes that I already know and love, such as Creamy Tomato Soup and Italian Patty Melts. Maybe I'll get motivated this weekend, but I wouldn't count on it! Cate at Sweetnicks tried Rachael's recipe for Buffalo Chicken Pot Pie and deemed it delish. The lawsuit against the producers of Rachael Ray's Inside Dish was dismissed. Rachael will definitely be returning to her high school for her yearly fundraiser. 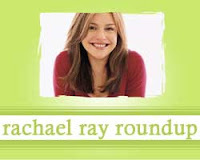 All Things Cupcake alerts us to a current contest being run by Rachael Ray's magazine. Laavanya of Cookery Corner tweaked a Rachael Ray recipe to make Creamy Veggie Pasta. Tart Reform tried Rachael's method for making Chicken Parmesan Subs.